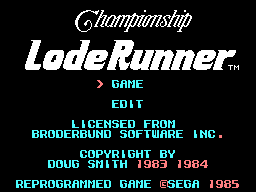 Championship Lode Runner (チャンピオンシップロードランナー) is a puzzle/action game which servers as an update to Lode Runner. It almost exactly the same game, but contains 50 of the most challenging levels divised. The SG-1000 version also introduces music and offers a slight change in graphics.